Twiggs Trend Index can be plotted on currencies, precious metals, commodities and indices where no volume data is available. 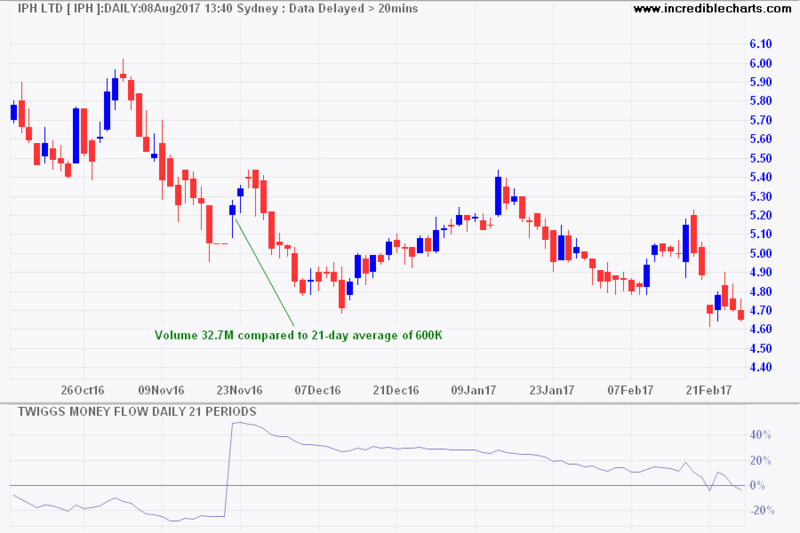 Here, IPH Ltd [IPH] on the ASX experienced a volume spike, with 32.7 million shares changing hands in a single day compared to the 21-day average of 600,000. 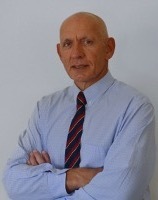 Twiggs Money is clearly distorted, signaling strong buying pressure. Twiggs Trend Index avoids distortion, displaying a short bear market rally while continuing to warn of a down-trend. 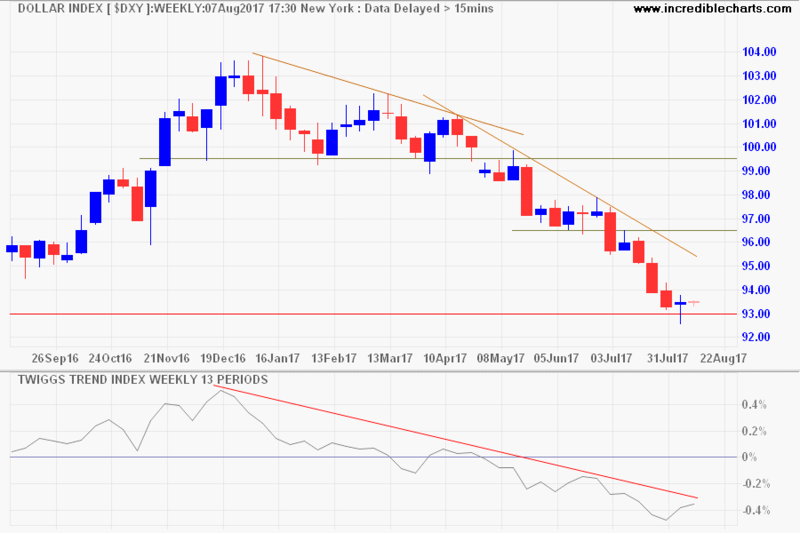 Here Twiggs Trend Index is plotted on the weekly US Dollar Index [DXY]. No volume is needed. Twiggs Trend Index signals accumulation if above zero, while negative values signal distribution. The higher the reading (above or below zero), the stronger the signal. Go long if breakout above resistance is supported by Twiggs Trend Index above zero. Go short if breakout below support is confirmed by negative Twiggs Trend Index. 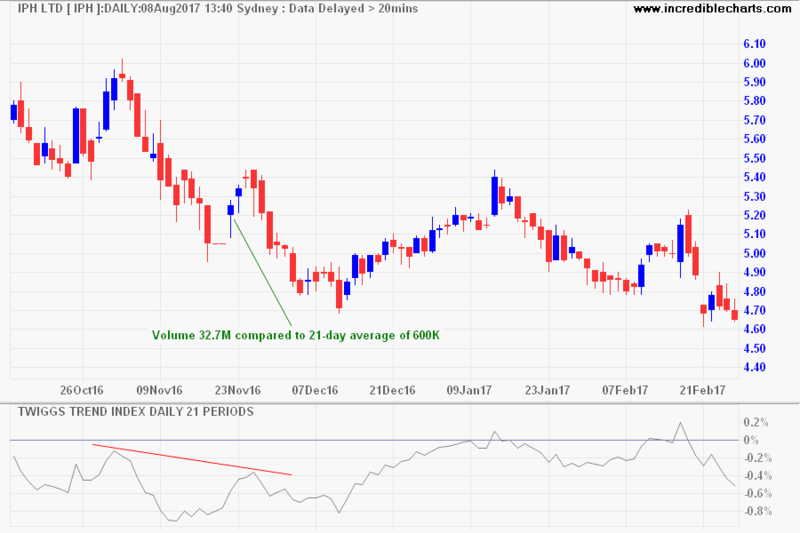 Go long on a bullish divergence. Go short on a bearish divergence. Twiggs Trend Index trends downwards and completes a peak without crossing above zero. 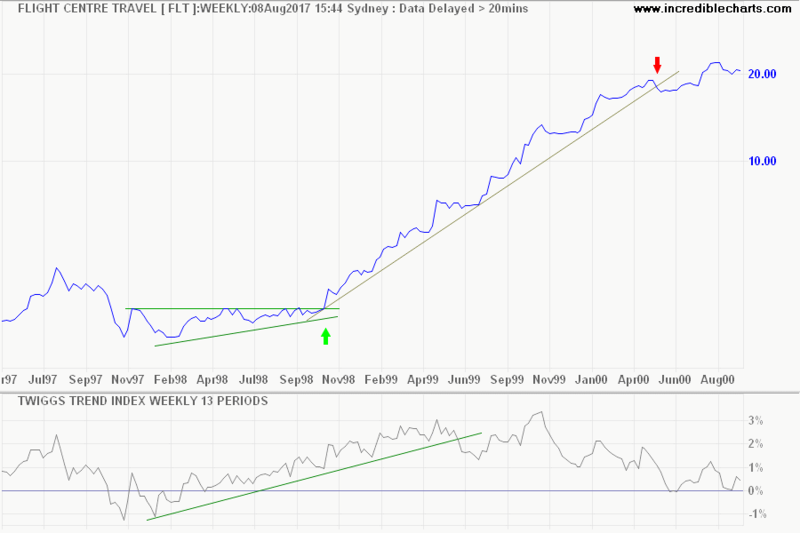 One of the best signals I have seen on Twiggs Money Flow is this classic Flight Centre [FLT] breakout, plotted here with 13-week Twiggs Trend Index and 30-week Weighted Moving Average. A large bullish ascending triangle in 1998 warns of a potential breakout. Rising Twiggs Trend Index confirms strong buying pressure. Go long [green arrow] on breakout above resistance at $3.15. At the time I used to take exits using Stan Weinstein's 30-week Weighted Moving Average (or Exponential MA) which here provides a great exit signal. Even if you exit using a trendline as in the chart below — penetration warns that the trend is losing momentum — you would still capture a large portion of the trend. 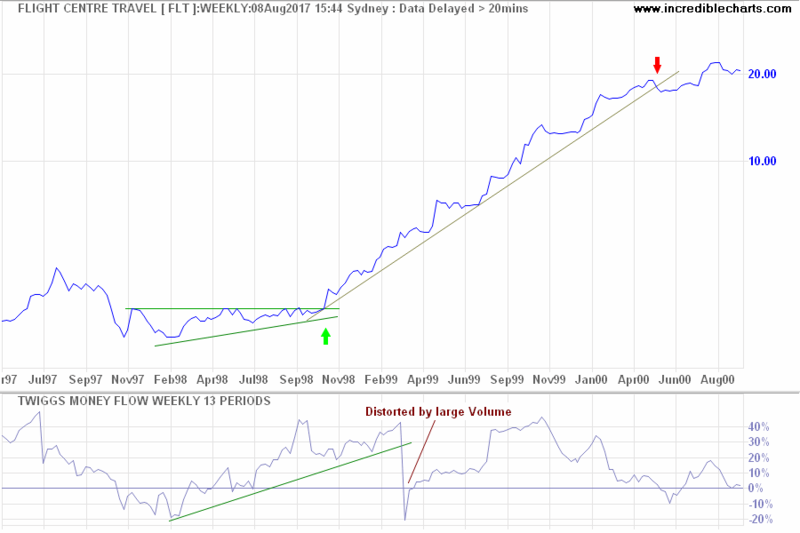 The chart below shows Twiggs Money Flow (13-week) for the same period. Note how indicator values in March 1999 are distorted by another large volume spike. The default period is set at 21 days but I often use 13 weeks with a longer term weekly chart. See Indicator Panel for directions on how to set up an indicator — and Edit Indicator Settings to change the settings. 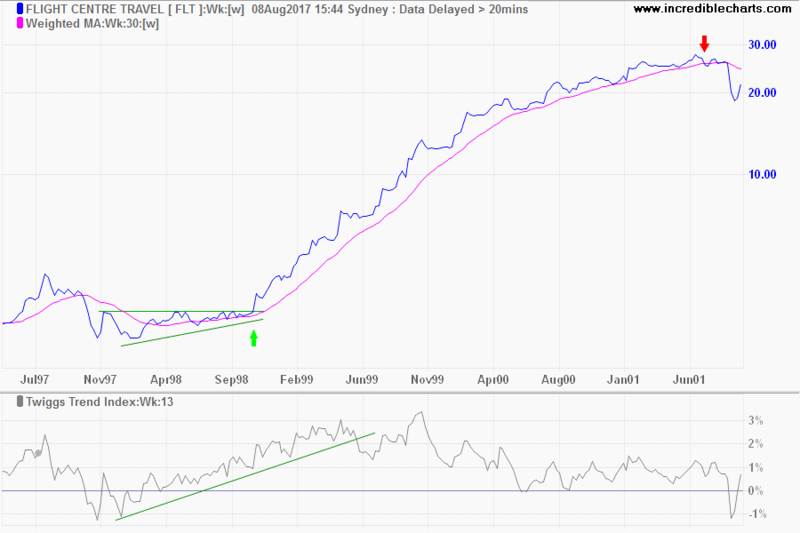 Twiggs Trend Index is a variation on Twiggs Money Flow that uses Volatility instead of Volume. The formula is proprietary and is not disclosed. A useful substitute for Twiggs Money Flow but best used together with the Money Flow indicator, to provide a more rounded view of market sentiment.